Are you involved in the community, volunteering for community organizations? Citizens Bank is offering the Trufit Good Citizen Scholarship to students who are directly connected to their community. The application period for the TruFit Good Citizen Scholarship will begin on Monday, April 1 and run through Friday, April 19, 2013 or until 3,000 applications have been received, whichever occurs first. Winners will be announced this summer. The scholarships will be awarded for the 2013-2014 academic year. Citizens Bank will award 40 college scholarships totaling $50,000. One winner will receive $5,000; four winners each will receive $2,500; and 35 winners each will receive $1,000. Applicants are asked to submit an essay of no more than 250 words or a video up to 60 seconds long that describes their community volunteerism and leadership. They must also provide two references that are directly connected to their community involvement. For full details, rules and to apply, go to citizensbank.com/scholarship. These are the MAP events for the week of April 1. Time Management Workshop. Starts at 1:00 PM in the Academic Support Center 1st Fl. Campus Center. MAP Miles: 50. Event Capacity: 10. DISC- Understanding Style Differences: Starts at 12:00 PM on the 11th Fl of the Healy Library Room 0011B . MAP Miles: 100. Event Capacity: 40. On-Campus Interviewing Preparation. Starts at 2:00 PM in the Campus Center 3rd Fl, Room 545. MAP Miles: 50. Delta Sigma Pi Presents: Sexual Harassment Prevention Training. Starts at 4:00 PM in the Point Lounge 3rd Fl, Campus Center. MAP Miles 75. Response Is Required. Time Management Workshop. Starts at 10:00 AM in the Academic Support Center, 1st Fl Campus Center. When your enrollment appointment arrives, you should be able to go back to your shopping cart and complete the enrollment request – which means you are officially requesting that Wiser add you to the courses. At that time you will get an official confirmation of your enrollment, or an error message, that will give you more information once you click on it. And, we always encourage you to check on any error message you get – so that you can see if you can solve it yourself. Errors can be caused by holds, missing pre-requisites, two classes at the same time, and other registration issues. Students who started in the College of Management in the Fall of 2006 or later are required to participate in the Management Achievement Program (MAP). Students in MAP must complete 75% of their required MAP miles before registering for MGT 490. You can view your earned MAP Miles by logging on to the CMWeb, as well as view a schedule of upcoming events there and here on the blog (MAP page or weekly posts). It is important to note that we cannot save a spot in MGT 490 for someone planning to complete their MAP miles, or register students with fewer than 75% of their miles earned. Once all pre-requisites for MGT 490, including MAP Miles, are earned, students should be able to register themselves for MGT 490 on Wiser. Summer and Fall registration starts the week of April 1. Some students have an advising hold which makes a meeting with an advisor mandatory; and students without an advising hold are still strongly encouraged to meet with someone before registration. Below are some tips on advising preparation and making the most of your registration advising session. – Make an appointment early (with a University Advising Center advisor); or plan to come to walk-ins NOW (in CM, for declared concentrators). Waits for advising only get worse as registration gets closer. – Be prepared. Print your degree audit before you meet with an advisor, and bring it to your session. – Do your research. Look over your degree audit for remaining requirements and then look on Wiser and/or course wizard to see which requirements are being offered in the upcoming semester. Add those to a list of possible courses options to discuss with your advisor. – Write down your questions – and ask them! After looking over your degree audit, you should spend some time thinking about classes you might want to take, questions you might have about policies or your graduation progress. – Be open to having an honest and (hopefully) enjoyable conversation with your advisor about your courses and future. Remember we are here as partners with you to help you meet your goals while navigating the university system. All College of Management students have an academic advisor that they should consult with before registration, or making other significant decisions regarding their schedule, enrollment plans, or graduation path. CM students with a declared concentration can see any of the advisors in the College of Management Undergraduate Program Office during walk-in hours. While there is no advising hold on CM students with declared concentrations that mandates advising, you are still strongly encouraged to meet with someone each semester. The name of your personal academic advisor can be found on your student center on Wiser. Comments Off on Flush your BAD Habits!! 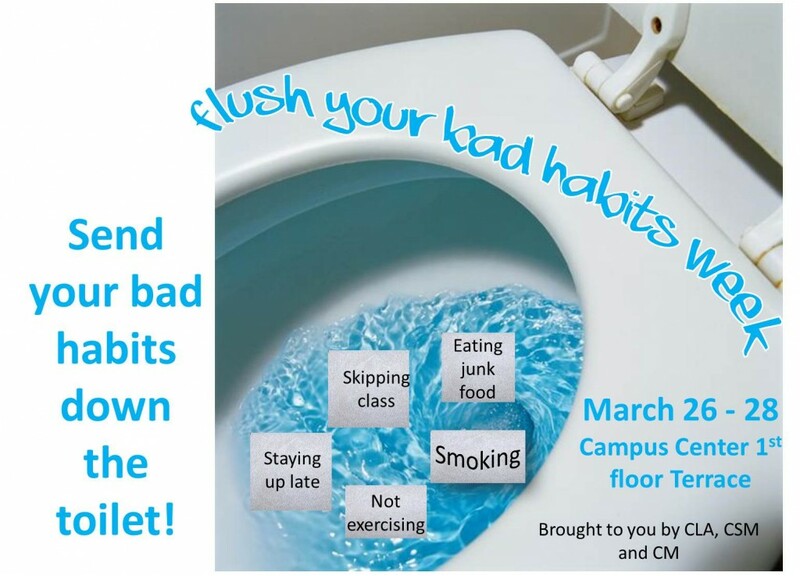 Check out the table this week in the Campus Center to FLUSH your Bad Habit!! Comments Off on HOLD on there! Registration for the Fall 2013 semester starts on April 1 for students with 100+ credits (and continues to open for all students throughout April); and registration for summer 2013 courses opens for ALL students on April 1. To see if you have any holds, log on to Wiser, go to the Student Center page, and check the blue sidebar on the right. One box will say “Holds” and list any that you might have. Holds can go onto your account at anytime, so you should check here periodically. You are encouraged to removed these NOW, so that when your registration appointment arrives, you can enroll in Summer or Fall 2013 classes with as few obstacles as possible. Beta Gamma Sigma presents: “Meet the Leaders of Business” Starts at 3:15 in the CC- 3-550A. Event Capacity: 150. Guest Speaker Denise Morrison. MAP Miles: 50. Check out the latest internships on the Career Services page.